I was at the Goodwill Clearance Center. I walked over to the table on wheels where toys were heaped in piles, and I saw her there. She was one of my oldest friends, but I hadn’t thought about her in years. 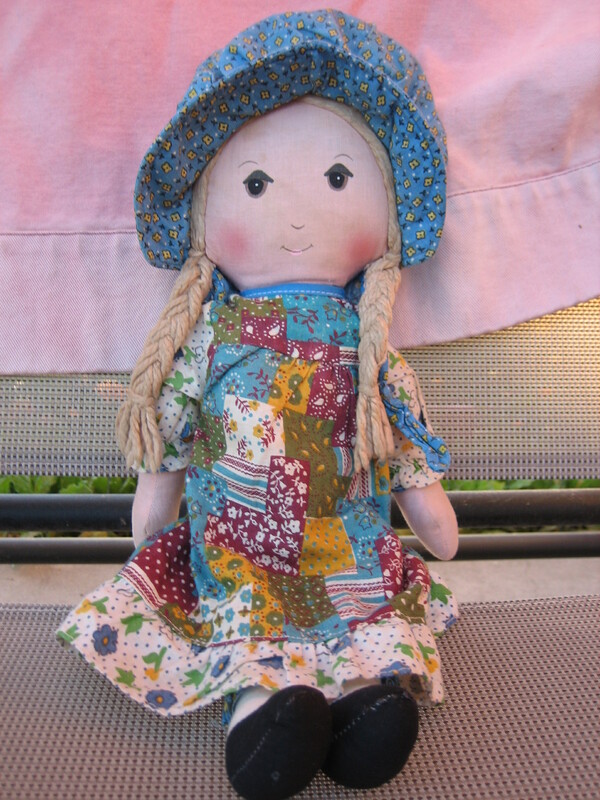 She looked the way I remembered her: beige “blond” braids, small features on a cloth face, blue bonnet with tiny yellow flowers, “patchwork” dress, bloomers which matched her bonnet, and black cloth shoes. I scooped her right up and put her in my basket. I took this photo of the Holly Hobbie doll I found at the Goodwill Clearance Center. Through the years, I had other Holly Hobbie toys. I had a much smaller, plastic Holly Hobbie doll with a picnic play set. She had weirdly synthetic combable hair. I named the dog Chocolate because it was the same color as a Hershey’s kiss. One time I had the set at my mawmaw’s house and was showing it to my aunt. She was holding the doggy, and I said, “That’s Chocolate.” She thought I meant it was made of actual chocolate and was kind of grossed out/embarrassed that she was touching what she thought was my candy. My sister had the The Holly Hobbie General Store. This was a Colorforms toy, and it was super cool because unlike most Colorforms at the time, it was 3-D! You slid the walls into slots on the floor, and the walls stood up. All the little girls stood on their bases and could be moved inside or outside. I really liked to set up all the little slick plastic “objects” in their proper places in the store, but once everything was set up, I lost interest. I guess I was a little too old for imaginative play, by the time my sis got this set. When I was younger, I had a different, smaller Holly Hobbie Colorforms set. I managed to play with the set for hours at a time, even though the dress-up possibilities were limited. I guess I knew from reading the Little House on the Prairie books that those old time girls didn’t have a lot of wardrobe options. I had Holly Hobbie sewing cards too. I spent countless hours lacing the bright yarn through those little holes. Is this how I learned to sew? My lunchbox all through elementary school and into middle school looked had Holly Hobbie and her friends on it. The story was absolutely fantastic! It is about a girl (probably in her early teens) whose archeologist dad is missing in Central or South America. Holly Hobbie, the girl’s ancestor, comes alive and steps out of a portrait. Although Holly Hobbie is the protagonist’s ancestor, when the portrait was painted she was about the same age as this particular descendant, so that’s the Holly Hobbie who comes to life.The two girls go on a quest to save the dad. I read this book multiple times and absolutely loved it. I read it in the mid 80s, when books with strong, brave girls as main characters were more difficult to find than they are today. With all of this Holly Hobbie in my life, my favorite was always the stuffed doll. 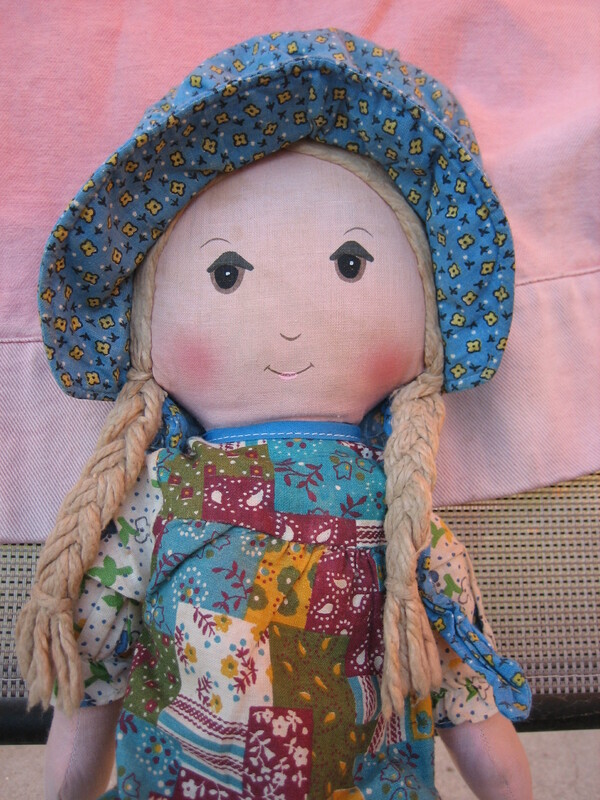 I remember being really little and crying and wiping my tears onto my Holly Hobbie doll’s face. Holly Hobbie was my first best friend. That’s why I had to rescue her from the megabig thrift store, and that’s why I’m going to be a grown woman riding around with a Holly Hobbie doll in her van. I don’t care who thinks it’s weird.